The Los Angeles Angels visit Tropicana Field on Wednesday to play the Tampa Bay Rays. The probable starters are Jered Weaver for the Angels and Drew Smyly for the Rays. The opening line for this matchup has Los Angeles at +143 and Tampa Bay at -153. The over/under was set at 8.5. The Angels have a 34-48-3 over/under record and a 41-44-0 run line mark, meaning they cover 48% of the time. The Rays are 34-48-0 against the run line and have a 37-40-5 over/under record. They cover the spread 42% of the time. The Angels head into this matchup with a 33-50 record, including 17-24 on the road. Starting pitcher Jered Weaver has a 6-7 record with an earned run average of 5.51 and a WHIP of 1.48. He has 54 strikeouts over his 94.2 innings pitched and he has given up 114 hits so far this season. He has allowed 10.8 hits per 9 innings and he has a FIP of 5.69. The bullpen this year has an earned run average of 4.12 and they have given up 272 base hits on the year. Teams are hitting .254 against the bullpen while being struck out 215 times and walking 101 times this season. As a team, Los Angeles has allowed 7.24 hits per nine innings while striking out 9.39 batters per nine. They are 4th in the league in team earned run average at 3.39. The Angels pitchers have collectively given up 770 base hits and 374 earned runs. They have allowed 108 home runs this season and they allow 1.3 homers per nine innings as a staff. Los Angeles as a pitching staff has walked 268 batters and struck out 583. They walk 3.3 men per 9 innings while striking out 7.2 per 9. They have a team WHIP of 1.42 and their FIP as a unit is 4.71. As a team, Los Angeles is batting .239, good for 28th in the league while putting together a .244 average away from home. The Angels hold a .389 team slugging percentage and an on-base percentage of .313 which is good for 21st in baseball. They rank 28th in baseball with 7.98 hits per game. Mike Trout comes into this game hitting .324 and his on-base percentage is at .426. He has 99 hits this season along with 59 runs scored and 54 runs batted in. He's struck out 65 times and has walked 54 times. Kole Calhoun is hitting .283 and he has an on-base percentage of .352. He has totaled 89 hits so far while scoring 48 runs and he's driven in 44. He has walked 31 times and has struck out 62 times. The Angels have 753 hits, including 149 doubles and 81 home runs. They've stolen 31 bases while they've been thrown out stealing 17 times. Los Angeles has walked 239 times this season and they've struck out 492 times as a unit. They've left 554 men on base and have a team OPS of .736. They score 4.4 runs per contest and have scored a total of 365 runs so far this year. Tampa Bay comes into this matchup with a 18-25 home record and a 34-48 overall mark. With an earned run average of 5.33, Drew Smyly has a 2-9 record and a 1.26 WHIP. He has 108 strikeouts over the 96.1 innings he's pitched during which he has given up 97 hits. He has allowed 9.1 hits per nine innings and his FIP stands at 4.3. So far this season the bullpen has an earned run average of 4.79 and they have given up 257 base hits on the year. Teams are hitting .268 against the Rays bullpen while being struck out 218 times and walking 91 times this season. As a team, Tampa Bay has allowed 9 hits per nine innings while striking out 8.66 batters per nine. They are 20th in the league in team earned run average at 4.47. The Rays pitchers as a team have surrendered 723 base knocks and 359 earned runs so far this season. They have given up 110 home runs this year and they give up 1.4 home runs per nine innings as a staff. Tampa Bay as a staff has walked 251 hitters and struck out 695. They give up a walk 3.1 times per 9 innings while they strike out 8.7 per 9. Their team WHIP is 1.35 while their FIP as a staff is 4.34. As a team, they are batting .240, good for 27th in the league while putting together a .229 average at home. The Rays hold a .424 team slugging percentage and an on-base percentage of .307 which is good for 25th in baseball. They rank 26th in baseball with 8.07 hits per contest. Evan Longoria comes into this matchup batting .278 and he has an OBP of .329. He has 88 hits this year along with 45 runs scored and 45 RBI. He's struck out 77 times and has walked on 25 occasions. Logan Forsythe is hitting .299 and he has an OBP of .359. He has collected 63 hits so far while he's scored 30 runs and drove in 19. He has earned a walk 17 times and has punched out 50 times. 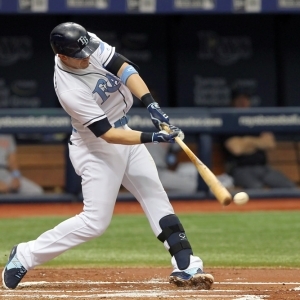 The Rays as a unit have 662 base hits, including 145 doubles and 112 homers. They have 27 stolen bases while they've been thrown out 19 times. Tampa Bay as a team has walked 243 times this year and they have struck out 753 times. They've had 549 men left on base and have an OPS of .731. They score 4.02 runs per game and have totaled 330 runs so far this season.